The Cook's Tour: Food.Baking.Travel. : "Hurricane Cookies"
OK, not really. The proper name of these delicious morsels is "Chocolate Oatmeal Raisin Cookies," but when you are baking during Hurricane Irene, that's the name that sticks! These are from Martha Stewart. I love, love, love a good oatmeal cookie, especially soft ones with a nice chew to them. But for those of you who like your oatmeal cookies crispy, this recipe provides an option for that, too. It has just the right amount (IMHO) of raisins and chocolate, and is immensely satisfying. I am thinking, however, of adding coconut to the next iteration (gilding the lily?). Here's hoping that you were not seriously impacted by Irene's path. 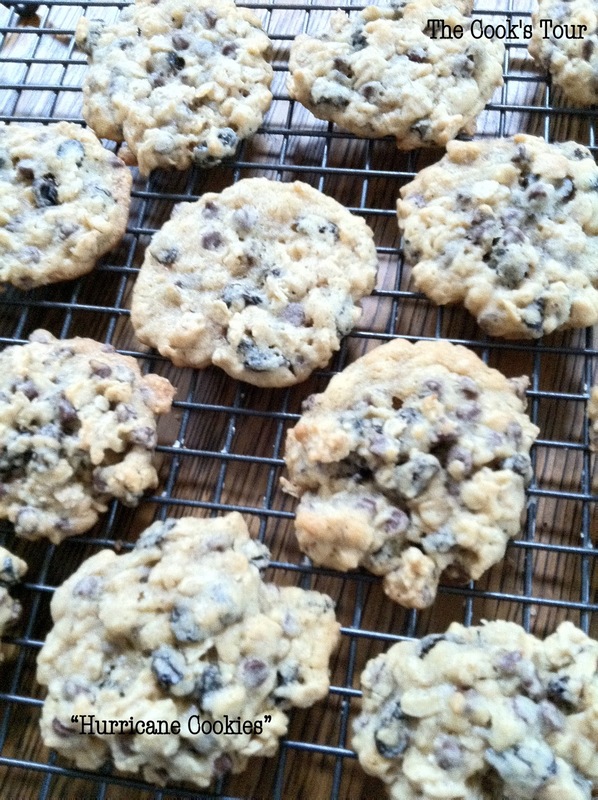 If you prefer a crispier texture, bake the cookies at 350 degrees for 16-20 minutes. Makes 32 cookies.